If you are in a hurry and just want to find out what the best extra large family tent is, then we recommend the Spacious Family Sized 16-Person Weather Resistant Ozark Trail as the best one. If you camp with a large group, you’re probably over pitching multiple small tents. Therefore, you’re in the market for the best extra large family tents that will house everyone with a bit less effort. While it’s slim pickings when it comes to supersized accommodations for big families and groups, we do have some advice and recommendations for you. The top perk of an extra large tent? Enough floor space for everyone so that you can stop elbowing each other. But what are the other advantages of a giant tent for the whole group? Whether you have one family or multiple groups coming together, getting everyone under one “roof” eliminates the need for the door-to-door dash. And when it comes down to keeping the kids dry when there’s a torrential downpour, there’s no better way than confining them all to the same spacious tent. At the same time, extra space indoors means you won’t have to resort to leaving your gear outside. Many family-sized tents have separate storage space or at least enough rooms that you can designate one as the storage closet. While you will find tents that aim to offer one large space inside, most multi room tents come with room dividers. You can split up the interior of the tent to create a feeling of privacy for each camper. Whether it’s couples, single adults, or groups of kids, it’s often difficult to find privacy while camping. With zipper or tie-back dividers, you can put up walls for changing purposes or privacy at night. You can even put pets in a separate space if necessary. If you usually travel with a group or just your own family, you may be familiar with pitching multiple tents. And no matter how easy they are to set up, repeatedly pitching tents at the start of every camping trip can become exhausting. And while you may spend a bit more time up-front pitching your extra-large family-size tent, once you finish the job, that’s it! So what sounds better, spending 30 minutes pitching one tent, or spending five minutes each pitching ten tents? 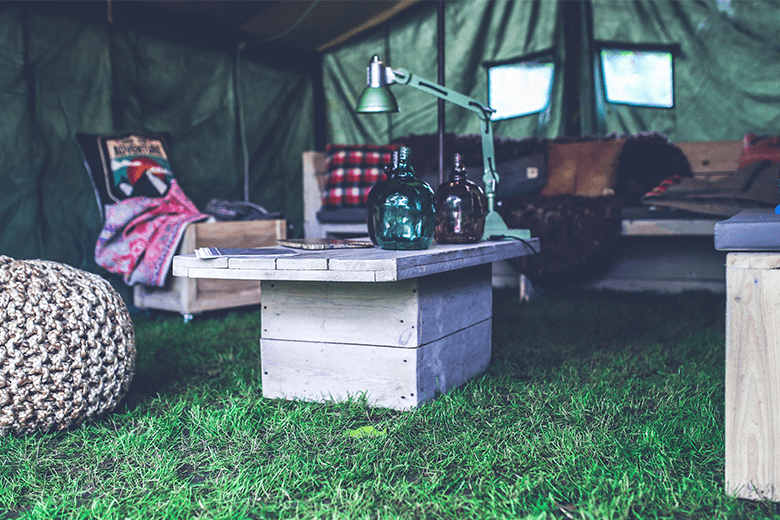 Not all tents are equal when it comes to creating a home-away-from-home for your campers. Here’s what to look for in an extra large family tent. Further, keep an eye out for tents that offer ventilated mesh ceilings, as those are often ideal for camping in warmer months. Even in colder temperatures, more than ten bodies in a tent means a high likelihood of condensation forming overnight. To keep everyone dry and comfortable, you’ll want to maintain good air crossflow. So not only are windows essential but so are breathable mesh panels elsewhere in the tent, such as in the roof or closer to the floor. Since so many people will be entering and exiting the tent, you’ll want to seek out the most durable materials possible. This applies to both the polyester or other material of the tent body, the flooring, and the quality of the mesh and zippers. The more campers use the door, the higher the odds the zipper or mesh will fail. Also, multiple entryways make for better longevity since more than just one door will receive use over the course of a camping trip. Depending on your family’s needs and your preferences, you’ll want to note how many doors you want in a tent. Some families prefer one door per “room” or area so that people can come and go without disturbing anyone else. However, families with younger kids or pets may prefer fewer doors. This way, kids aren’t taking off without warning and pets aren’t trying to exit after you close the doors. In general, the larger the tent, the more entrances it will have. But what type and how many doors you want depends on a few factors- so it is something to think about before you go shopping. While many tents advertise occupancy ratings of anywhere from 10 to 16 people, how many people you can actually fit inside depends on a few factors. For example, if you plan to bring along inflatable or other mattresses, you may not be able to fit as many people as if they brought sleeping bags instead. Of course, the more stuff you stow away inside, the less floor space you have for sleeping arrangements. Therefore, you may want to look at the square footage of the tent in addition to the occupancy total for a more realistic idea of what the interior space is like. A high-capacity tent that doesn’t sacrifice creature comforts, the Tahoe Gear Ozark 3-Season 16 Person Large Family Cabin Tent gives enough space for up to sixteen people. The body of the tent is mostly mesh with an open ceiling, plenty of windows, and floor vents for breathability. Of course, there’s also a rain fly that covers the entire top of the tent and even extends over the entrance to keep the weather out. There’s another entrance door, as well, so not everyone has to crowd in or out one doorway. However, both doors are on one half of the divided tent. The dividers create up to three separate rooms, including one “master suite” area, which is where the two doors are. Two smaller rooms feature a fabric divider in between and no door access. However, there are plenty of windows. There’s not much in the way of wall storage, but there is a power port for electrical cord access. If you need plenty of sleeping quarter space and storage options, the Spacious Family Sized 16-Person Weather Resistant Ozark Trail has what you need. It has three separate rooms (each with its own entrance) that can fit up to 16 people in sleeping bags or up to four queen size air mattresses. Along with all the floor space, the tent has tons of storage availability. There’s a media pocket, gear hammock, three bottle holder pockets, and three large pockets for stowing further stuff. The fly seams and inside binding help keep the elements out, but you can also remove the rain fly in favorable weather to enjoy the view from the mesh ceiling. The mesh windows help with airflow, but since the manufacturer counts each of the door panels as a window, that means the two rooms have only one each. Overall, however, this 16-person tent has all the amenities you need for a large family or camping group. And, even with only two or three tent masters, you should be able to have this behemoth set up in about 20 minutes. Its center height is a bit lower than comparable tents, but the Wenzel Mammoth 16-Person Family Dome Tent has plenty of interior space for up to 16 campers. Overall, it’s a dome shape that divides into three rooms, two a bit smaller than the third. The larger room houses the main entrance, while the smaller rooms share a two-door exit. Plenty of windows and a fully-mesh ceiling help increase the airflow. The primary entrance uses double doors, and the rain fly creates a canopy to protect against the elements. But in nicer weather, you can enjoy the open-air concept. However, the tent is likely more comfortable in warmer weather, especially since the wall and fly are 600mm material. Although it has lots of mesh paneling, there’s enough wall space for some storage pockets to stow your smaller items. For family camping tents that can last through all four seasons, the Teton Sports Sierra Canvas Tent has everything you need. It’s not the most affordable of our top picks, but it will keep you warm and cozy all through winter if that’s your preferred camping season. In warmer weather, you can roll up the bottom of the tent for extra breathability and comfort. Or, prop the door open for great views and great ventilation. There are also ground-level vents to enhance the airflow even when you close everything up. Though the leak-proof floor and heavy-duty canvas covering mean you’ll be dry and comfortable, it also means the overall package weighs in at over 60 pounds. Of course, the tradeoff is a sturdy tent that will last. Although its weight is comparable to other tents in this class, the Spacious Family Sized 16-Person Weather Resistant Ozark Trail earns our vote as one of the best extra large family tents out there. Despite the large size, it only takes around 20 minutes to set up, so you can get to other camping activities faster. Plus, this Ozark Trail tent has more storage space than any other tent of its size, meaning you can use up even more of the floor space since your gear can stow away in the storage pockets. And with three separate rooms, there’s adequate space for all your people and your stuff.